In Victorian Hong Kong, a race is on to find a young gifted Asian woman, Amaya. As two underground spy organizations compete to find her, Amaya becomes involved in the seedy underground of the opium trade. The illicit drug seems to be the only cure for her realistic dreams and terrorizing nightmares. But Amaya doesn’t realize that while she sleeps, what she sees are visions of the future and that her unborn child will share her visionary gifts. A Society operative Jacob Wadsfellow tries to bring Amaya back to the safety of the Society and his collection of mystical dolls. But a charming double agent, Brother Evan woos her with both his affections and the opium. 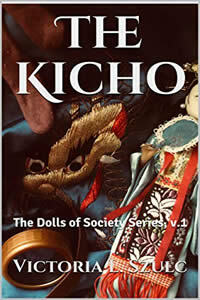 The Kicho is a Society Series short story about a visionary in peril, how addiction can affect so many lives, and how the hope of an unborn child and her doll will save the future.